and preventative dentistry practices including much needed infection control. At each location, they then led the widows in proper tooth brushing and flossing technique. Thanks to the volunteering of one of the children, in Tripoli the widows were able to practice what they were taught. Mohamad instructs on the importance of using latex and gloves in some oral situations. The awareness of oral hygiene and prevention of caries have been obviously raised. The mothers were very motivated to attend the lectures and they were very receptive during the presentations. There did not hesitate to ask several questions and they actively participated in the discussions. This class was attended by seven very inquisitive widows. 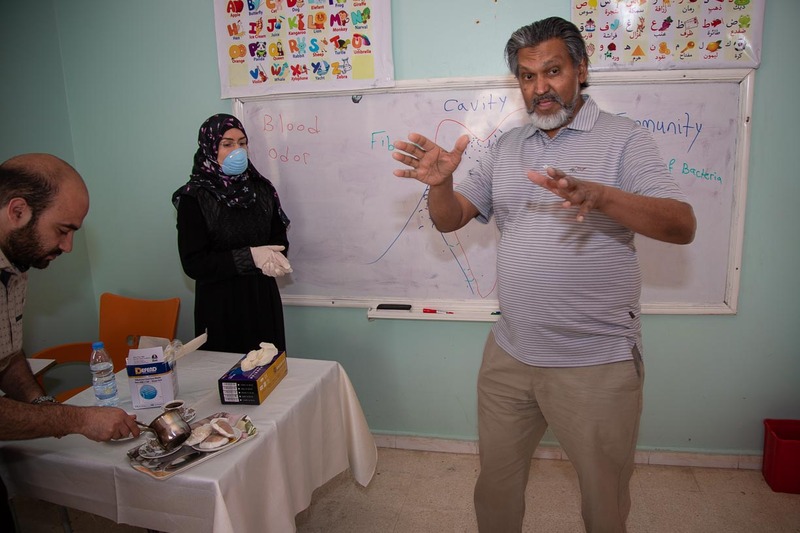 The intersection of dental health and the reality of the psychological state those who have fled Syria as refugees was introduced in the form of grinding and other stress related issues. Mohamad and Fareeda taught the ladies various relaxation techniques and impressed upon them the great importance of slowing themselves down, for health both psychological, physical and dental. We both were very impressed with the smooth running of the facilities and the dedication of the staff as well as the volunteers. We felt there was a real team-spirit. The children were very respectful and well behaved.They displayed tremendous amount of resiliency and coping skills considering the trauma they went through. this shows that the HLA program is addressing the needs of this population because within a couple of years these children and mothers are living a well balanced life coping with their sorrows and loss. This is amazing and it makes HLA work stands out.